Andalusia has so many lovely pueblos blancos (white villages) but none more dramatic than the town of Arcos de la Frontera perched on top of a spectacular rocky ridge. 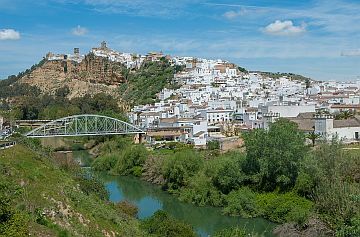 It is because of its impressive location as well as its beautiful architecture that Arcos has been declared a national historic-artistic monument. Over the centuries the location had always attracted settlers because of its plentiful water supply and highly desirable defensive position. However, the town has continued to remain relatively small with a population of only 28,000. The newer part was built on the lower slopes, whereas the old quarter is higher up and leads to the castle at the top via a labyrinth of cobbled streets lined by beautiful 18th century palaces. It was during the Middle Ages that Arcos was at its most prosperous. Occupied by the Arabs for part of that period, it was they who built the Castillo de los Arcos and made the town such a defensive stronghold. The castle was rebuilt by the Christians in the 12th century to re-enforce its presence and secure the town’s safety. It eventually became the home of the Duke of Arcos, and today it is privately owned therefore not open to the public. The best way to explore the old quarter is by starting at the bottom of the Calle Corredera or the Paseo de los Boliches. The Calle Corredera is lined with shops giving you a chance to browse on your way up, but if you want views of the countryside take the route to the right which is the Paseo de los Boliches. Either way both lead to the main square, the Plaza del Cabildo, and along the way you will pass the 16th century Hospital de San Juan de Dios. Once you reach the Plaza you will find some of the town's finest buildings. The Town Hall was built in the 17th century and inside is a painting by Goya himself of King Carlos III. On the south side of the square is the Mirador de la Pena Nueva where you can get some jaw dropping views from the top of the cliff of the orange and olive groves in the valley below. 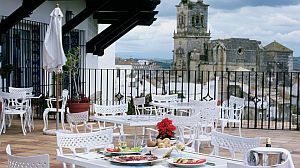 The Parador Arcos de la Frontera (Hotel Casa del Corregidor) is also situated in the square and was originally a palace in days gone by before being converted into what is now a luxury hotel. This hotel is a stunning place to base yourself while you are here, with its Andalusian courtyard, spectacular views, and exceptional restaurant serving regional cuisine. If you walk down the street to the left of the Parador you will come to the 16th century Iglesia de San Pedro which is also perilously positioned on the edge of the cliff face. Rising above the whitewashed houses is the Minor Basilica of Santa Maria de la Asuncion. Most of the church was developed during the 15th and 16th centuries and is open plan with three naves, a Gothic interior, and a number of Renaissance features. As mentioned earlier the town has many impressive palaces, and two in particular are the Palacio del Conde de Aguila with its elaborate stone facade and the Palacio de Mayorazgo. Other fine buildings to visit are the Convento de la Encarnacion which served as a chapel and hospital before it was converted into a convent, and the Convento de la Caridad with its ornate interior and attractive courtyards. The Iglesia de San Agustin was originally a convent as well but it later became a monastery until it was eventually abandoned. There are several exciting festivities in Arcos throughout the year such as the Roro de Aleluya which is held on Easter Sunday and involves two bulls charging through the streets of the old town. Early August is when they hold the Fiesta de la Virgen de las Nieves with lots of live music and flamenco dancing. At the end of September there is also a three day festival dedicated to the town’s patron saint called the Feria de San Miguel. As you are not that far away from two National Parks there are also plenty of outdoor activities to enjoy as well. The Parque Natural Sierra de Grazalema is directly east of Arcos and to the northwest is Donana National Park. The Donana National Park has off road guided tours of dunes, pine forests and unspoilt beaches. Alternatively you can explore it on horseback or mountain bike. However, a particularly special time to visit is during the El Rocio Pilgrimage in late Spring when thousands of pilgrims make the journey through the park on horseback or in decorated carts to the village of El Rocia. It is always a great excuse for lots of music and dancing along the way making it a very festive event.